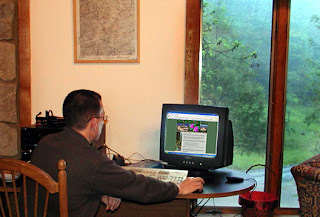 When we bought the Inn on Mill Creek, one of our (well, Dave’s) ideas was to have a “walk-up” PC for our guests. We already have wireless internet service throughout the Inn, but if you don’t bring your laptop with you, the Wi-Fi doesn’t really do you any good. Well…now you can check your e-mail, Google a nearby restaurant or attraction, or find out if your favorite baseball team won their latest game — right in our Great Room. Of course, Dave, being the tech-savvy guy that he is, has his entire music collection (6,000+ tunes) downloaded to MP3s, so you can also listen to some music while you’re relaxing. This entry was posted in Uncategorized and tagged improvements, innkeepers and innpugs by Inn on Mill Creek. Bookmark the permalink.